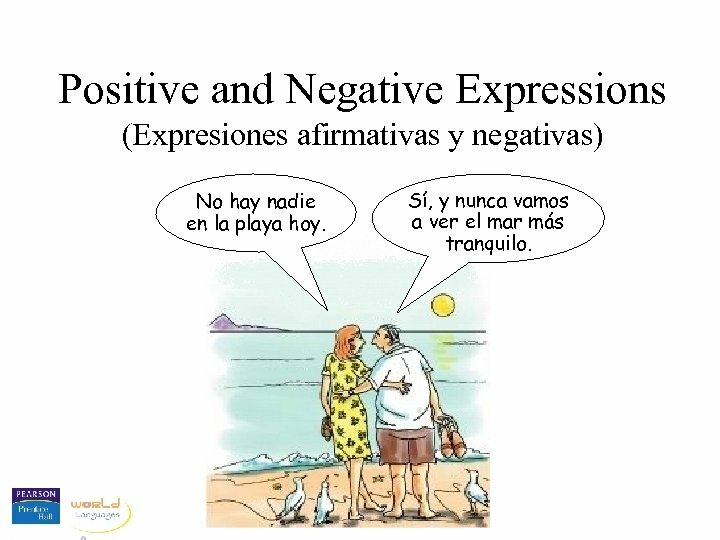 Positive and Negative Expressions (Expresiones afirmativas y negativas) No hay nadie en la playa hoy. Sí, y nunca vamos a ver el mar más tranquilo. algo → nada ¿Hay algo en la hielera? Is there something in the ice chest? No, no hay nada en la hielera. 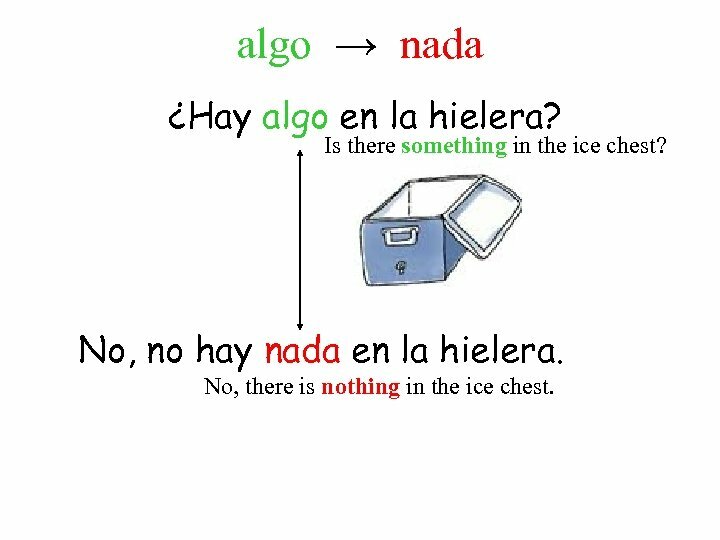 No, there is nothing in the ice chest. 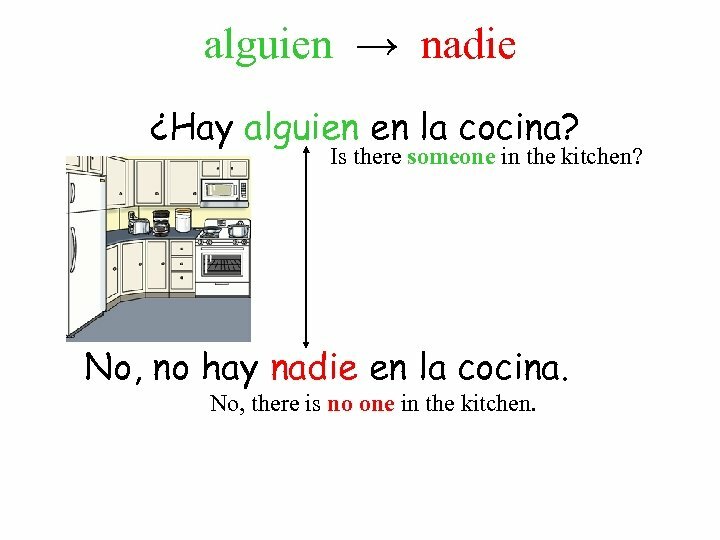 alguien → nadie ¿Hay alguien en la cocina? Is there someone in the kitchen? No, no hay nadie en la cocina. No, there is no one in the kitchen. 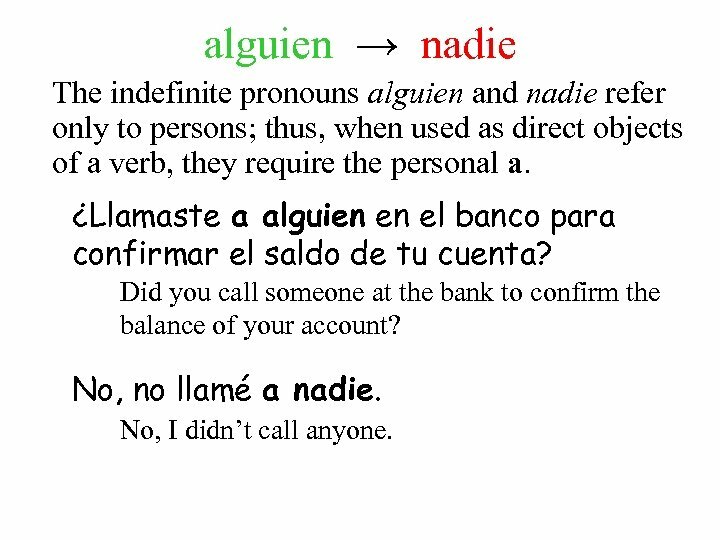 alguien → nadie The indefinite pronouns alguien and nadie refer only to persons; thus, when used as direct objects of a verb, they require the personal a. ¿Llamaste a alguien en el banco para confirmar el saldo de tu cuenta? Did you call someone at the bank to confirm the balance of your account? No, no llamé a nadie. No, I didn’t call anyone. algún, alguno → ningún, ninguno ¿Hay algún plato en la mesa? 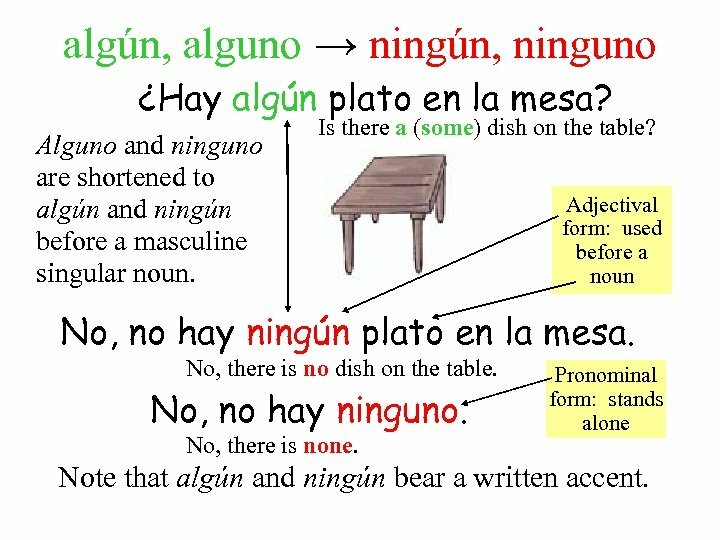 Alguno and ninguno are shortened to algún and ningún before a masculine singular noun. Is there a (some) dish on the table? 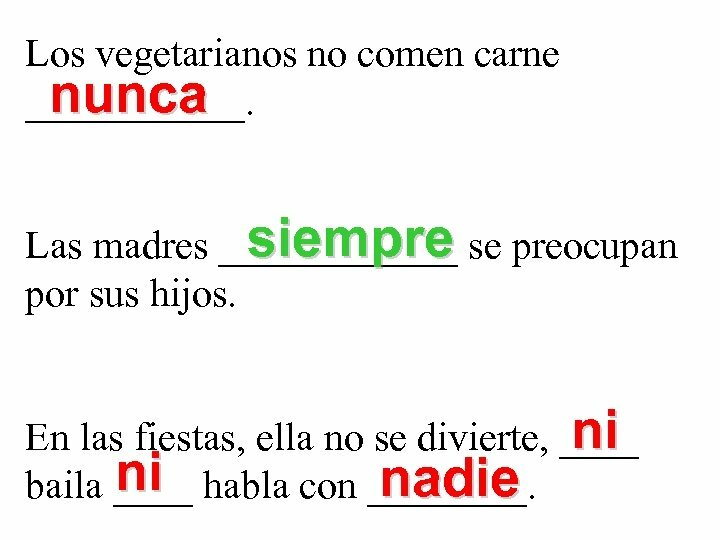 Adjectival form: used before a noun No, no hay ningún plato en la mesa. No, there is no dish on the table. No, no hay ninguno. No, there is none. 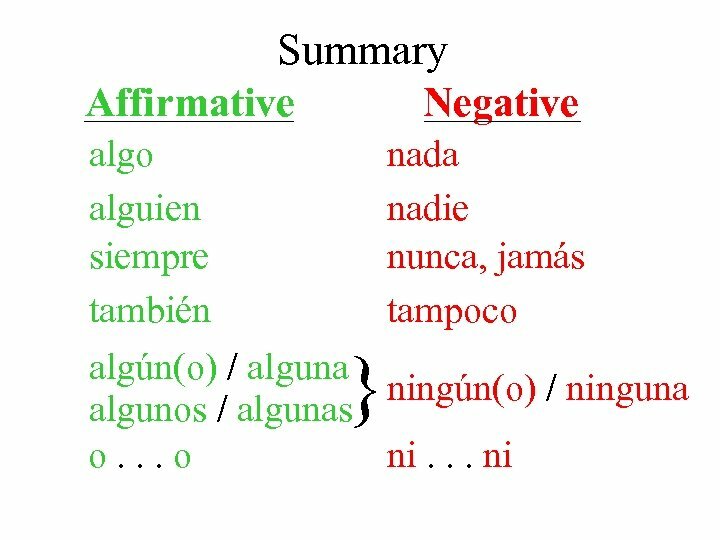 Pronominal form: stands alone Note that algún and ningún bear a written accent. algunos → ningún, ninguno ¿Hay algunos platos en la mesa? 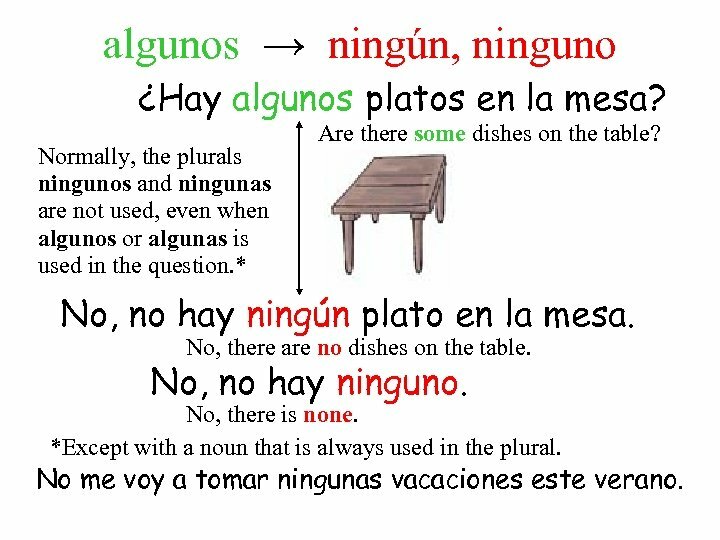 Normally, the plurals ningunos and ningunas are not used, even when algunos or algunas is used in the question. * Are there some dishes on the table? No, no hay ningún plato en la mesa. No, there are no dishes on the table. No, no hay ninguno. No, there is none. *Except with a noun that is always used in the plural. No me voy a tomar ningunas vacaciones este verano. algunas → ninguna ¿Hay algunas muchachas en el equipo de fútbol? Are there some girls on the soccer team? 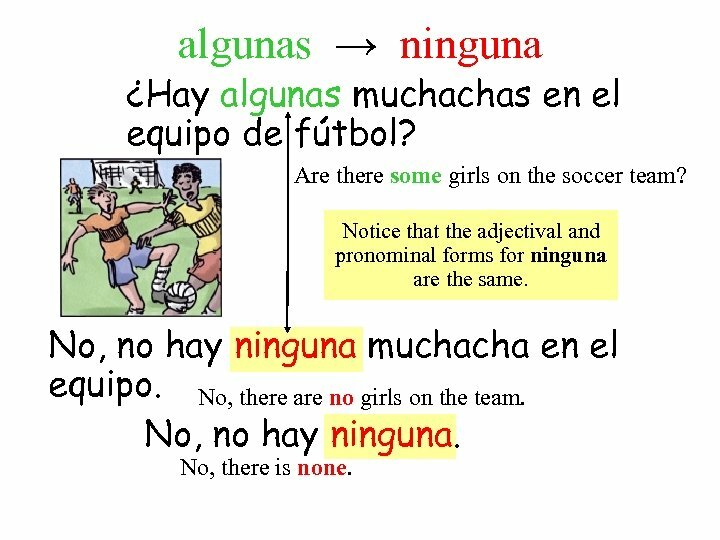 Notice that the adjectival and pronominal forms for ninguna are the same. No, no hay ninguna muchacha en el equipo. No, there are no girls on the team. No, no hay ninguna. No, there is none. o. . . o → ni. . . ni ¿Vas a comprar o zapatos o sandalias? Are you going to buy either shoes or sandals? No, no voy a comprar ni zapatos ni sandalias. No, I’m going to buy neither shoes nor sandals. (No, I’m not going to buy either shoes or sandals. ) 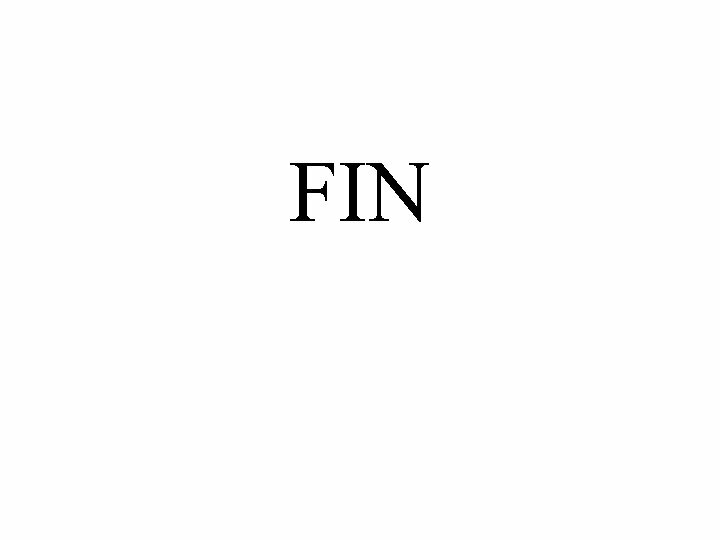 Note: The first o and the first ni are optional. 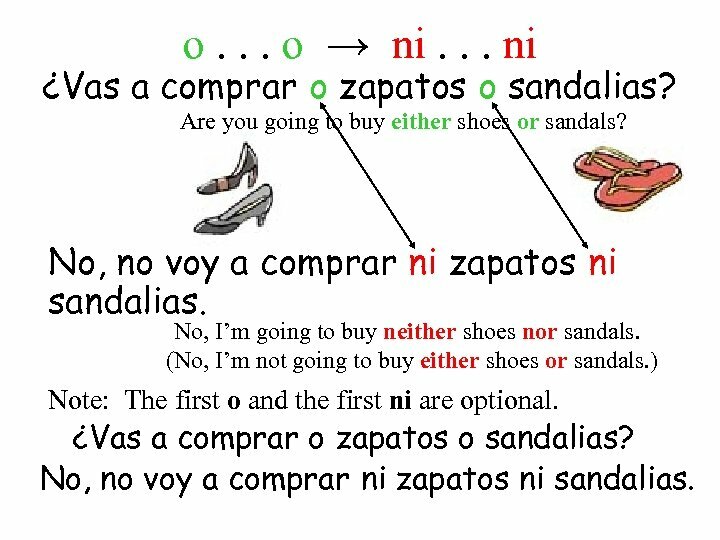 ¿Vas a comprar o zapatos o sandalias? No, no voy a comprar ni zapatos ni sandalias. 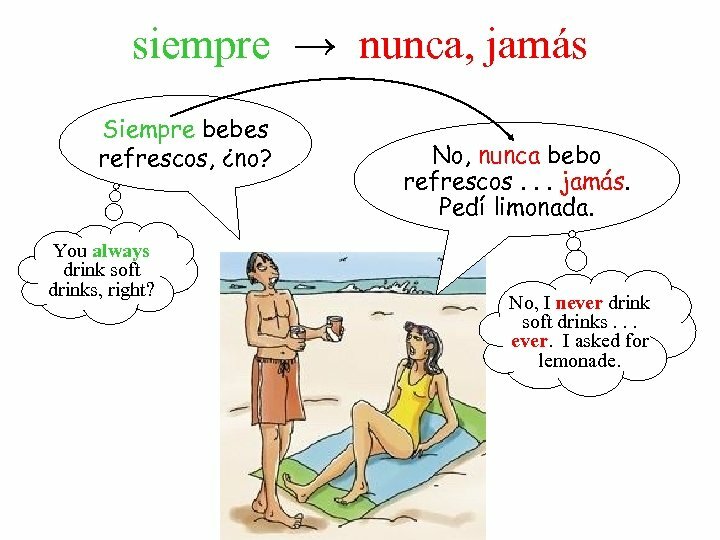 siempre → nunca, jamás Siempre bebes refrescos, ¿no? You always drink soft drinks, right? No, nunca bebo refrescos. . . jamás. Pedí limonada. No, I never drink soft drinks. . . ever. I asked for lemonade. 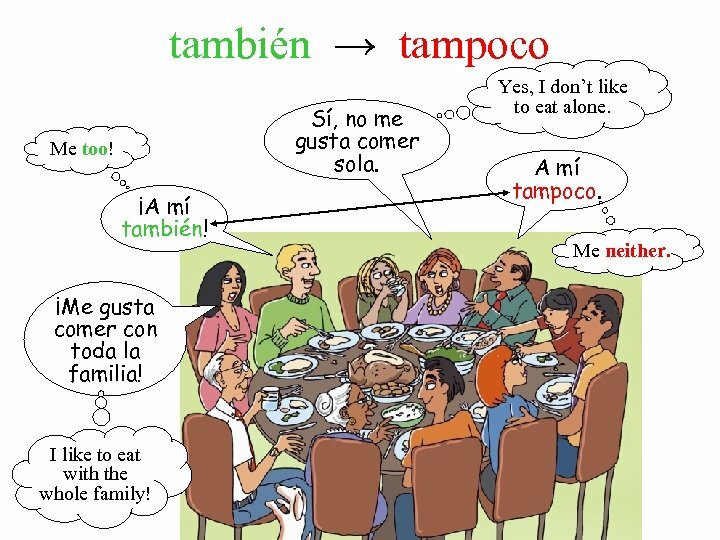 también → tampoco Sí, no me gusta comer sola. Me too! ¡A mí también! ¡Me gusta comer con toda la familia! I like to eat with the whole family! Yes, I don’t like to eat alone. A mí tampoco. Me neither. 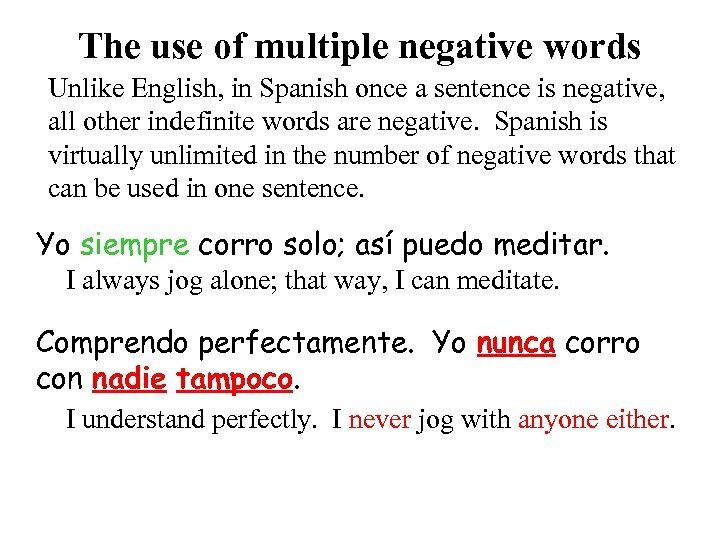 The use of multiple negative words Unlike English, in Spanish once a sentence is negative, all other indefinite words are negative. Spanish is virtually unlimited in the number of negative words that can be used in one sentence. Yo siempre corro solo; así puedo meditar. I always jog alone; that way, I can meditate. Comprendo perfectamente. Yo nunca corro con nadie tampoco. I understand perfectly. I never jog with anyone either. 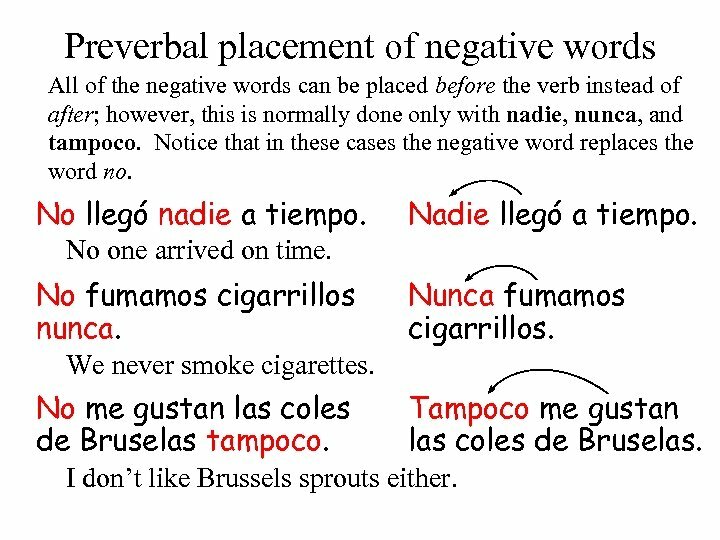 Preverbal placement of negative words All of the negative words can be placed before the verb instead of after; however, this is normally done only with nadie, nunca, and tampoco. Notice that in these cases the negative word replaces the word no. No llegó nadie a tiempo. Nadie llegó a tiempo. No one arrived on time. No fumamos cigarrillos nunca. Nunca fumamos cigarrillos. We never smoke cigarettes. No me gustan las coles de Bruselas tampoco. Tampoco me gustan las coles de Bruselas. I don’t like Brussels sprouts either. 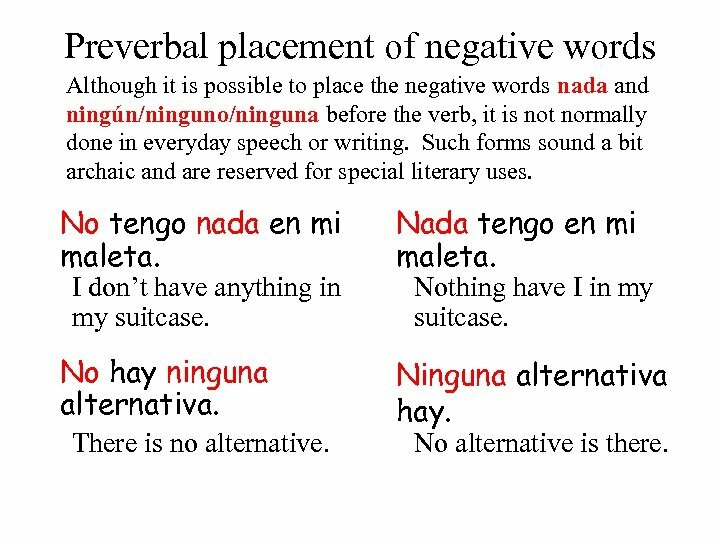 Preverbal placement of negative words Although it is possible to place the negative words nada and ningún/ninguno/ninguna before the verb, it is not normally done in everyday speech or writing. Such forms sound a bit archaic and are reserved for special literary uses. No tengo nada en mi maleta. Nada tengo en mi maleta. No hay ninguna alternativa. Ninguna alternativa hay. I don’t have anything in my suitcase. There is no alternative. Nothing have I in my suitcase. No alternative is there. 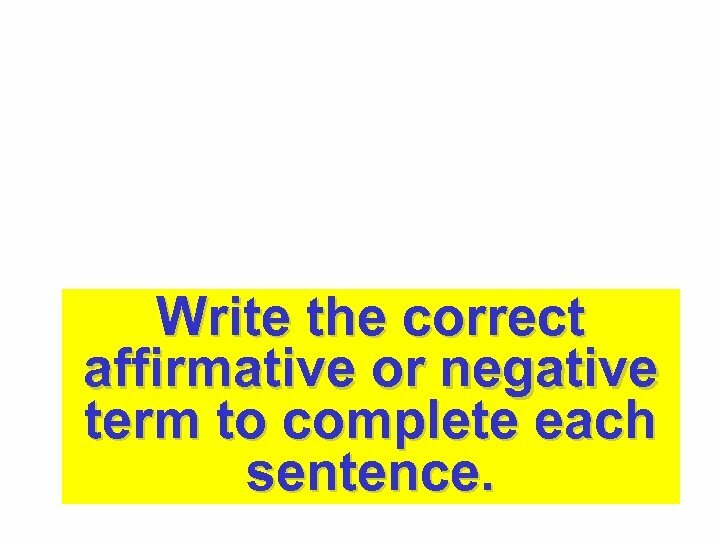 Write the correct affirmative or negative term to complete each sentence. We don’t understand any of the words. 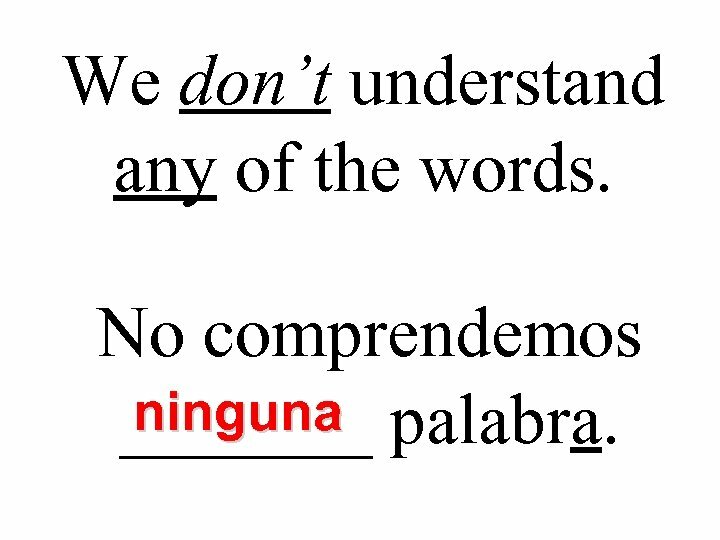 No comprendemos ninguna _______ palabra. He eats lunch with some friends. Él almuerza con algunos _______ amigos. Do you want something? algo ¿Quieres _____? Not one student did the homework. 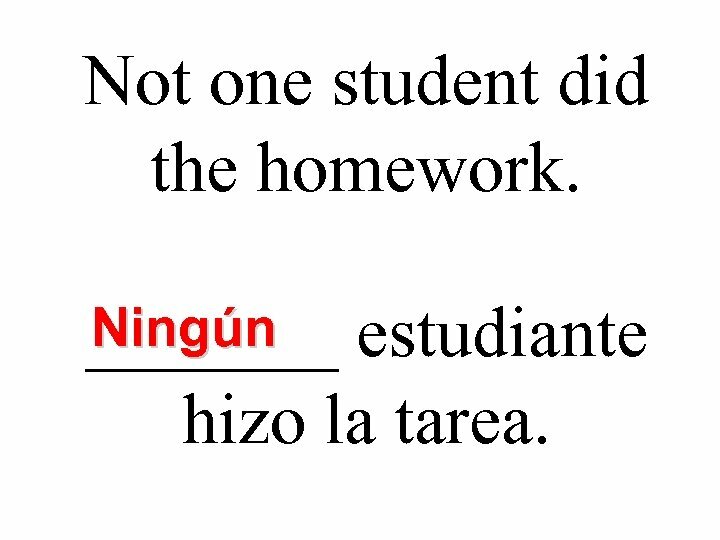 Ningún _______ estudiante hizo la tarea. 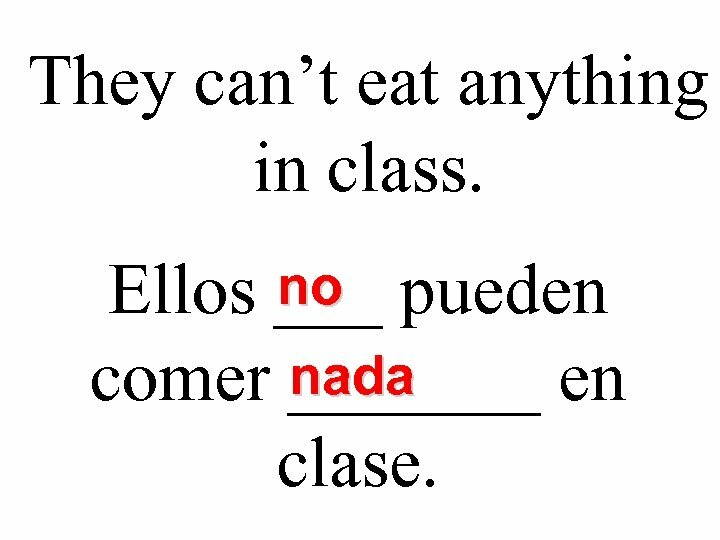 They can’t eat anything in class. no Ellos ___ pueden nada comer _______ en clase. Los vegetarianos no comen carne nunca ______. siempre Las madres ______ se preocupan por sus hijos. ni En las fiestas, ella no se divierte, ____ ni nadie baila ____ habla con ____. 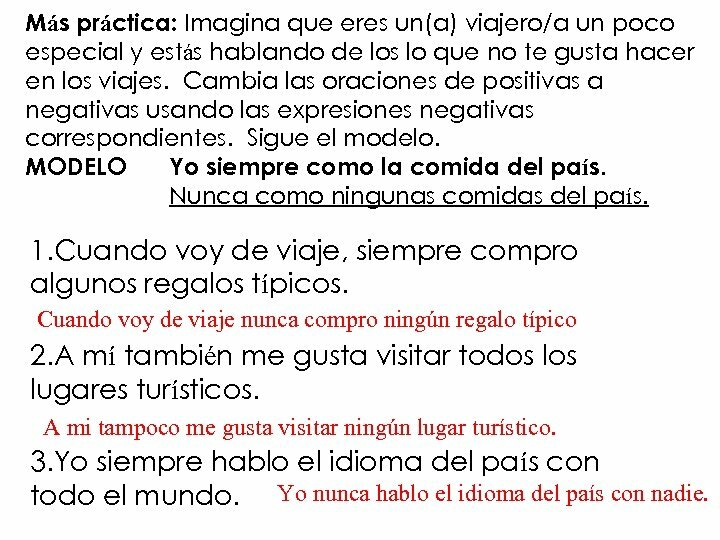 Más práctica: Imagina que eres un(a) viajero/a un poco especial y estás hablando de los lo que no te gusta hacer en los viajes. Cambia las oraciones de positivas a negativas usando las expresiones negativas correspondientes. Sigue el modelo. MODELO Yo siempre como la comida del país. Nunca como ningunas comidas del país. 1. Cuando voy de viaje, siempre compro algunos regalos típicos. Cuando voy de viaje nunca compro ningún regalo típico 2. A mí también me gusta visitar todos lugares turísticos. A mi tampoco me gusta visitar ningún lugar turístico. 3. Yo siempre hablo el idioma del país con todo el mundo. Yo nunca hablo el idioma del país con nadie. 4. 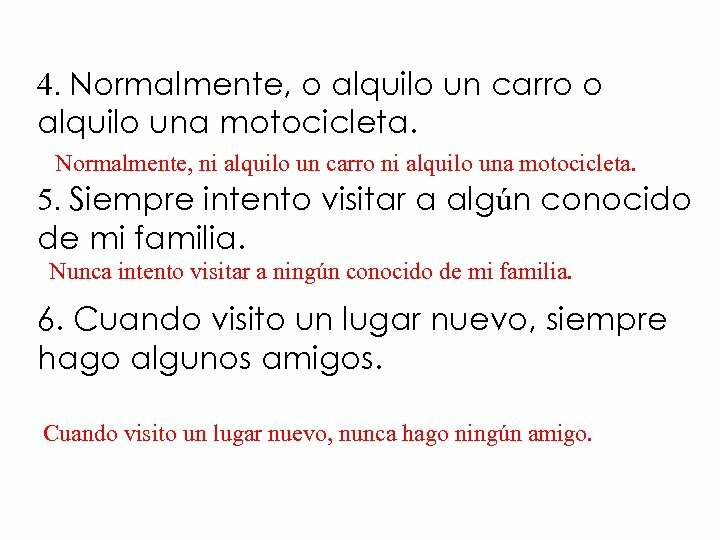 Normalmente, o alquilo un carro o alquilo una motocicleta. Normalmente, ni alquilo un carro ni alquilo una motocicleta. 5. Siempre intento visitar a algún conocido de mi familia. Nunca intento visitar a ningún conocido de mi familia. 6. Cuando visito un lugar nuevo, siempre hago algunos amigos. Cuando visito un lugar nuevo, nunca hago ningún amigo. 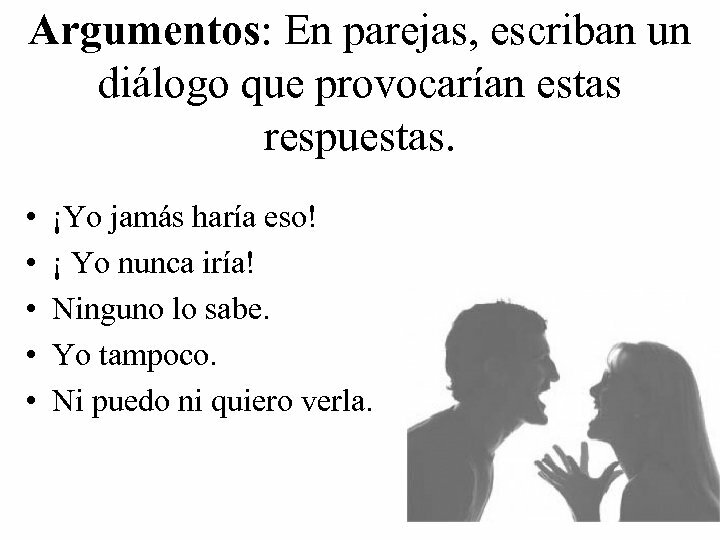 Argumentos: En parejas, escriban un diálogo que provocarían estas respuestas. • • • ¡Yo jamás haría eso! ¡ Yo nunca iría! Ninguno lo sabe. Yo tampoco. Ni puedo ni quiero verla.